Taxi Service in Patiala: Being the best taxi service in Patiala, 1313 Taxi welcomes its priceless visitors with the warm heart. You are searching for the rental cab service in Patiala and that’s all, you have reached your destination. 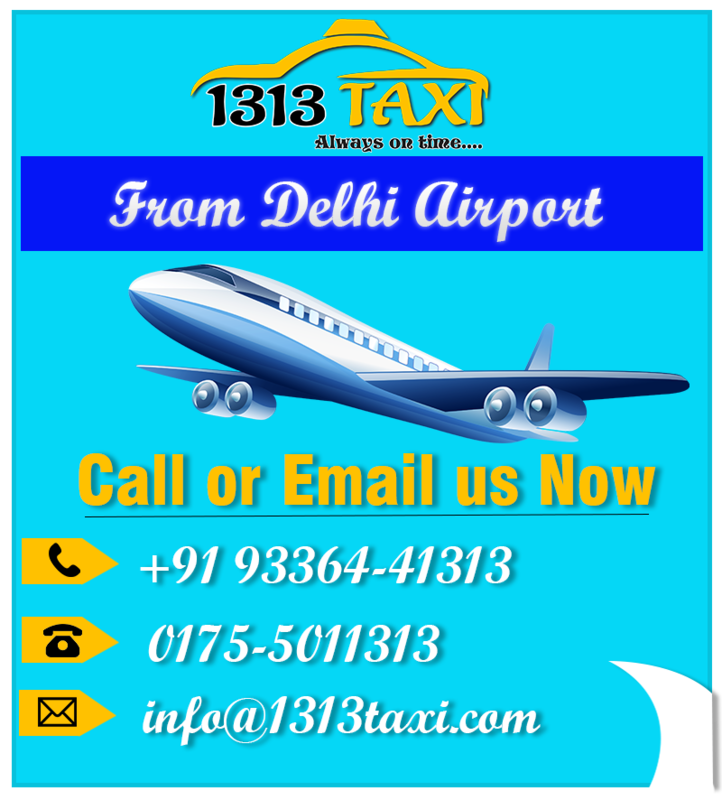 Because, we at 1313 Taxi, serve our customers with the best, trust-able and reliable Cab or taxi Service in Patiala. As we offer the pick and drop taxi service in Patiala with best possible fares. In addition, with 1313 Taxi, you have the option to book a tours and travels taxi service in Patiala, one way taxi service in Patiala or online taxi booking in Patiala at your convenient time and location. Pick and drop service is offered at any place with no time barriers. Moreover, customers have various options for Taxi booking in Patiala with 1313 Taxi at their own convenience. Simply, they can do this through our mobile app, through a phone call at +919336441313, or by dropping just a mail at our e-mail address. Why we have Best Taxi Service in Patiala?? Being the best service providers of the taxi stand in Patiala, we always try to work maintaining customer friendly environment. Similarly, they can book now and pay later with the Patiala cabs. You can enjoy our Luxury Cabs at cheapest fare rate. No extra charges for extra kilometers are there. As our Prices are the Inclusions of all the Toll & State taxes. We possess a super awesome support team to be pointed out as one of the taxi service in Patiala. 1313 taxi is available to customers 24*7. You can call or mail us any point of time, we will be there. You even have the option to chat with the taxi We also feel pleasure to give you the useful tips about your destination as well. Being the best taxi service in Patiala, we have the motto “100% customer satisfaction.” It is almost a reward for us to have a smile on your face. 1313 Taxi have outstanding customer service standards. We offer our customers with free call-backs services and a massive variety of vehicles as you have the best possible choice to choose from. Additionally, provide our customers according to their needs. Our vehicle collection includes Small Car, Medium Car, and large Car, 5-seater, minibuses and Volvo Coaches etc. Apart from these facilities, we provide the personal attention to every customer during the tour and also taking the feedback from them about our services. It enables us to make any modification required in our service. Moreover, our well-experienced and knowledgeable drivers always are carrying a mobile phone with them while driving. They also assist our visitors in their route planning. Tourists just have to send us a mail, including the places they want to visit. Our destination expert will immediately design the route plan for their forthcoming trip. 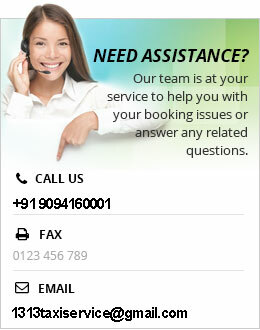 If you are an NRI visitor and your flight is about to land, we assist you immediately. As we have the best service in airport taxi in Patiala. If we talk about the availability of air-conditioning, the number of seats in the vehicle and the type of the cab, variety of options are available. Customers have the various payment options for the services. They can pay with Cash, Debit Cards, Visa Card, Master Card, Credit Card or cheques etc. We always pride ourselves as we are providing punctual and honest taxi service in Patiala. Similarly, our cabs are neat and clean and also up to industry standard. 1313 Taxi always considers the safety of passengers being the most important. Our duty is over only when passengers enter their home safely. Do you still have any query in your mind? In conclusion, don’t feel hesitation in calling us. Just pick your phone and dial a number +9336441313 and that’s it. We have a specialist team who will tell you about the time required to get to the airport and any other place across the city. We will be happy to answer your every question. One thing more, you can also our visit our FAQ page to get your queries answered.